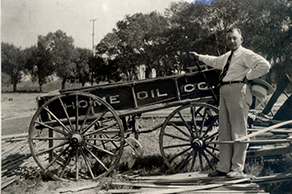 Albert Younglove shown here with a wagon from his Home Oil Company. Albert Norton Younglove was born in Rochester, Minnesota, to Norton C. and Sarah Younglove. At age 21, in 1888, Albert opened a grocery store in Rochester, and continued to run it until he and his brother, Frederick, came west with the family in 1892. While Frederick went to work at Gaylor Rouse’s store on Main Street, Albert pursued the oil business, following in his father’s footsteps. Albert married Margery Phillips and they had two children, Howard and Margaret. Albert formed Riverside’s Home Oil Company, the second local oil company. He sold petroleum products in almost 50 stations throughout Riverside and San Bernardino Counties. He also started the Home Oil Company in Anaheim. In 1901, Albert was one of the group of investors who formed Riverside’s first hospital. Dr. C. Van Zwalenburg had organized a meeting of local doctors at his home on December 5, 1901, and they agreed to go ahead and raise funds of $25,000 to capitalize the venture. After the stock was sold, the subscribers met to form the corporation on August 1, 1902. While the doctors were investors and agreed to serve as advisors, they wanted business people to run the association. George Frost was elected president and Albert Younglove, George Reynolds, George Bittinger, and Lyman Evans were elected directors of the Riverside City Hospital. Eventually Albert sold his Home Oil interests to his son Howard. At that point he started a new career, a new oil company in San Diego.